SORRY, I AM SOLD!!! Thank You, Steven & Amelia, of Forest Grove, OR!!! SORRY, I AM SOLD!!! THANK YOU, STEVEN AND AMELIA, OF FOREST GROVE, OR!!! New Timing Belt and Water Pump installed by Art Kuzma Motor's Service Department! 263 Horsepower DOHC 32 Valve 4.7 Liter V8! Rear Suspension Height Control! Comfort/Sport Suspension Control! Tow Package! 4WD Capabilities in a 7 Passenger Luxury SUV! Great Features include Power Moon Roof, Heated/Dual Power Leather Seats with 2 Driver Memory Seat, Power Tilt and Telescoping Wheel, Tri-Zone Automatic Climate Control Air, 11 Speaker MP3 Multi-Disc CD with Steering Wheel Controls, Rear Spoiler, Alloy Wheels, Fog Lights, Illuminated Running Boards, Automatic Headlamps, and Even More! 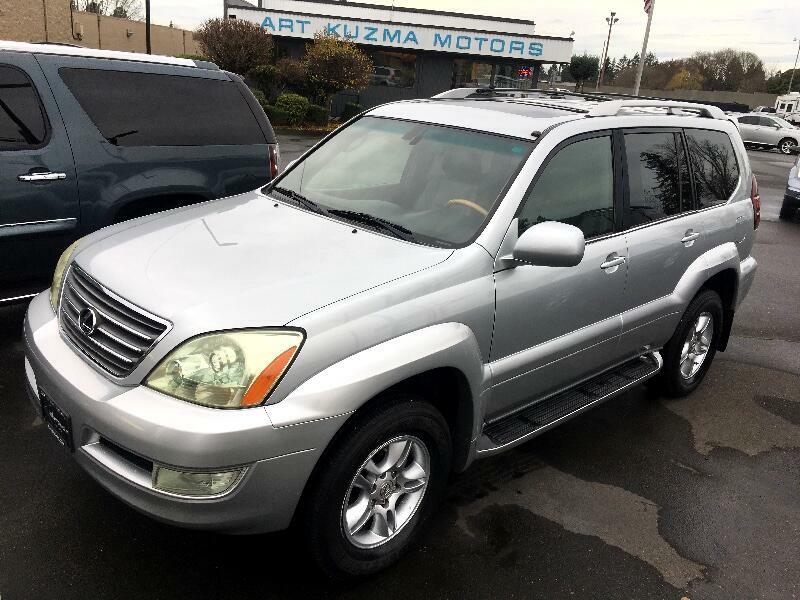 Compromise Elsewhere, this GX470 has Everything for Which You've Been Looking! Come Check It Out! -Voted Clark County's #1 Used Car Dealer and Best Auto Buying Experience!! -We Take the Worry Out of Buying Used Cars!- Family Owned and Operated since 1936; all of our vehicles are hand-selected, CERTIFIED, freshly serviced, safety checked, Clean AutoCheck Guaranteed, and have all passed a rigorous 140-point-plus Inspection! This process adds a high level of value & ensures supreme quality! We have hands down the Highest quality pre-owned vehicles -AND- the best prices to match! Being family operated, our atmosphere is easy, relaxed, family-friendly and pressure-free; come see the difference! All prices and specifications are subject to change without notice. Vehicle may be subject to additional sales tax; title; license fee; registration fee; $150 negotiable dealer document fee; finance charges; emission testing fees and/or compliance fees. State Issued Dealer License #0340. All prices and specifications are subject to change without notice. Vehicle may be subject to additional sales tax; title; license fee; registration fee; $150 negotiable dealer document fee; finance charges; emission testing fees and/or compliance fees. State Issued Dealer License #0340.